An introduction to abstract algebraic geometry, with the only prerequisites being results from commutative algebra, which are stated as needed, and some elementary topology. More than 400 exercises distributed throughout the book offer specific examples as well as more specialised topics not treated in the main text, while three appendices present brief accounts of some areas of current research. This book can thus be used as textbook for an introductory course in algebraic geometry following a basic graduate course in algebra. 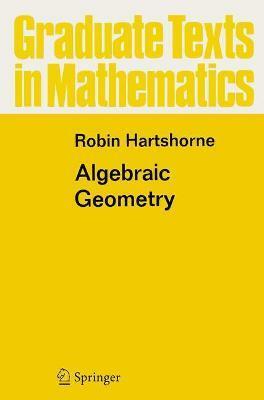 Robin Hartshorne studied algebraic geometry with Oscar Zariski and David Mumford at Harvard, and with J.-P. Serre and A. Grothendieck in Paris. He is the author of "Residues and Duality", "Foundations of Projective Geometry", "Ample Subvarieties of Algebraic Varieties", and numerous research titles. Illustrations note XVI, 496 p.
Introduction. 1: Varieties. 2: Schemes. 3: Cohomology. 4: Curves. 5: Surfaces. Appendix A: Intersection Theory. B: Transcendental Methods. C: The Weil Conjectures. Bibliography. Results from Algebra. Glossary of Notations. Index.